Toyota Ramps Up Hydrogen Fuel Cell Vehicles, As Japan Boosts Investment Japan doesn't think battery electric cars are the only future for transportation. It is investing millions to ramp up production of hydrogen fuel cell vehicles, citing their convenience for consumers. At Toyota's LFA Works plant in Japan, the automaker manufactures 10 Mirai hydrogen fuel cell cars a day. It has plans to ramp up production. 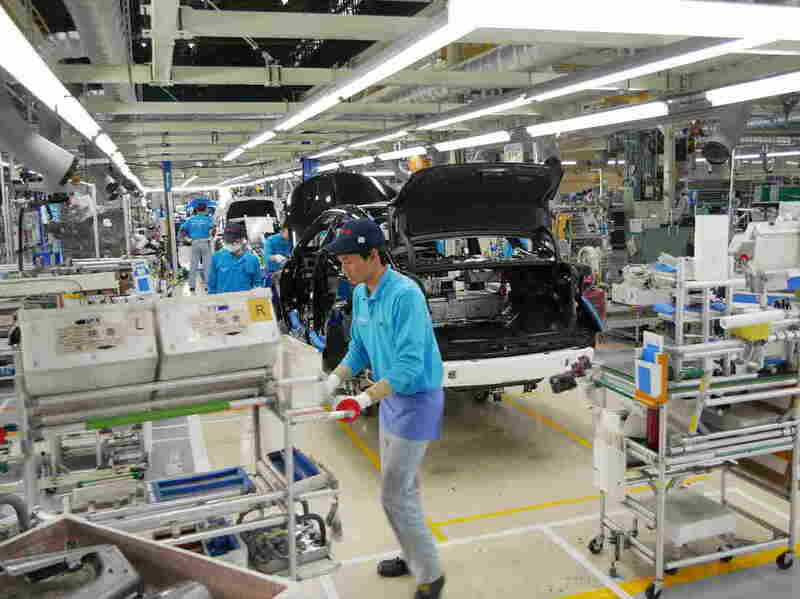 At the LFA Works factory in the city of Toyota, Aichi prefecture, workers install carbon-fiber hydrogen tanks on Toyota's new hydrogen powered fuel cell car. It's called the Mirai, which means "future" in Japanese. A hydrogen fuel cell doesn't burn anything. It uses a chemical reaction between the hydrogen and the oxygen from the air to produce electricity. Hydrogen fuel cell cars are quiet, like battery electric ones, and they emit only water. At this tiny factory, located inside Toyota's larger Motomachi plant, only about 10 cars are made each day, assembled by hand. "I love Mirai," says plant manager Matsuo Yoshiyuki, who owns one of the vehicles. "I believe in the future of hydrogen. It's very important for the [environment]." In Japan, the Mirai is expensive even with a generous government subsidy that brings it down from the equivalent of about $70,000 to about $50,000. The largest cost is the fuel cell production, but Toyota says that will drop as production ramps up. 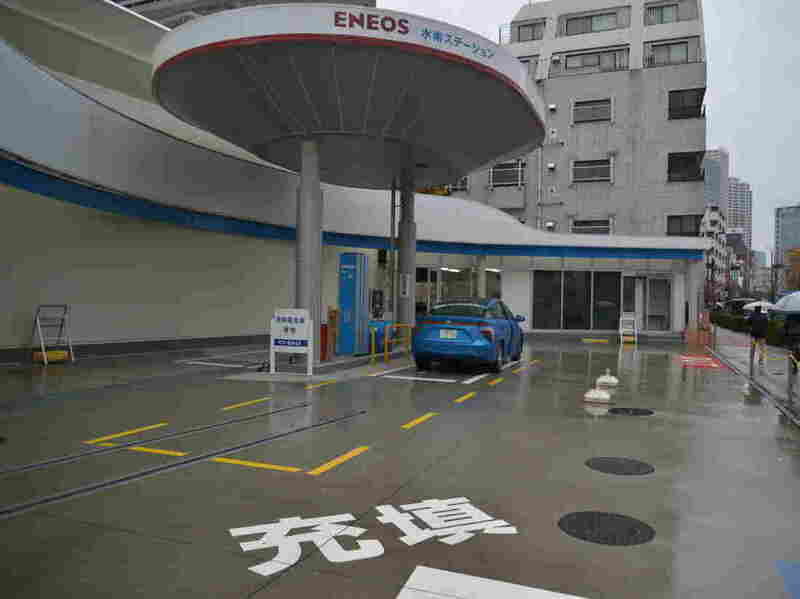 Japan has embraced the technology and aims to create the first "hydrogen society," which also includes the use of hydrogen for power generation. The energy ministry has ambitious targets in the lead-up to the 2020 Olympics. The city of Tokyo plans to deploy 100 hydrogen fuel cell buses during the games, and it wants to have 40,000 fuel cell electric vehicles on the road, with a longer-term goal of 200,000 such vehicles in the next six years. Today there are far more battery electric vehicles on the road than hydrogen cars, with more than 5 million plug-in cars worldwide, according to José Pontes, an analyst at EV-Volume.com, a website that tracks the industry. But in countries like Japan, where much of the population lives in dense urban areas, many people live in apartment buildings without a place to easily charge a car. It's here where companies like Toyota are banking on the convenience of the hydrogen fuel cell. "There's just no behavior change as long as you have [hydrogen] infrastructure in place," says Matthew Klippenstein, co-author of the online publication Fuel Cell Industry Review. "We go to the same gas station and fuel up in the same few minutes and just keep on tootling on." Klippenstein likens the divide between hydrogen fuel cells and battery electric plug-ins to the gasoline and diesel split familiar to American consumers. "We will see a similar split where batteries will, for decades at least, dominate the light duty vehicle passenger cars," he says, "whereas fuel cells will ultimately win out in the heavier applications." There aren't enough hydrogen fuel cell cars in Tokyo to make fueling stations like this one profitable, so the Japanese government subsidizes them. Another advantage of hydrogen could be reducing Japan's heavy reliance on Middle East oil. Hydrogen is abundant, and the fuel could be produced anywhere. But producing hydrogen fuel is itself energy intensive, and — just as with battery electric vehicles — it might be produced using natural gas or coal. "So it's not really clean if that is the case," says Kimiko Haraka of the Kiko Network, a Japanese environmental group. Haraka is critical of a plan by a number of Japanese companies, including Kawasaki Heavy Industries, J-Power, Iwatani Corp. and Marubeni, to build a plant in Australia that would use lignite coal to produce hydrogen for fuel cell vehicles. She also worries that the many subsidies for hydrogen come at the expense of promoting renewable energy. "They pretty much realize that the exhaust regulations will get tougher and tougher," he says. "What is being enacted right now, in 2020 in Europe, is nothing compared to what will come five years later, 10 years later." For now, though, Schmitt says the internal combustion engine remains the cheapest and most convenient car on the market. Despite massive investment, he says Toyota knows hydrogen won't be taking over the roads anytime soon. "They know that the guy sitting in the hydrogen fueling station will be very, very lonely for quite a while."